Do you looking for ways to merge multiple sound files into one recording such as merge ripped CD tracks into one, combine multiple chapters of an audio book and etc. You may try Merge MP3. 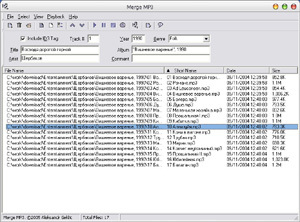 Merge MP3 is a free program that allows you to drag and drop MP3 files onto a playlist, change the order, preview the audio and then mix them all into a single MP3 files along with APIC images and ID3 meta-data. Sort files to be merged by filename ( with or without directory), date/time or size. Optionally write VBR frame into the merged file and is useful when merging files with different bitrates. No complicated installation – simply unzip the program and run from any directory. Very intuitive interface and fast merge speed. Download the latest release . Simply unzip MergeMP3.exe from inside the ZIP file, place it into any directory and execute it.